In the 1964 movie Goldfinger, we get a close look at Bond's shaving gear. 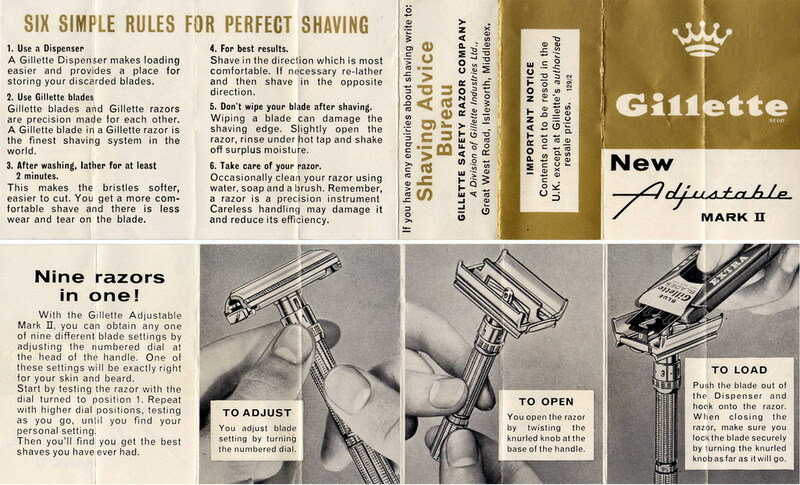 He uses a Gillette slim handle adjustable razor when he is shaving in Goldfinger's plane on the way to America. In the handle of the razor he has hidden the tracking device. After unscrewing the bottom part of the handle, he takes out the device, activates it and puts it in the hidden part of the heel of his shoe. Now that's a pretty cool 1960s spy gadget sequence that the modern Bond films can take an example of. The Gillette Slim Adjustable 1-9 razor is still easy to find on eBay (see below for the most recent offerings). Make sure to look for nice clean examples with original cases and paperwork. The online shaving store The Executive Shaving Company usually has a few of these original 1960s razors in stock as well (see their current Vintage Gillette Slim listings). Other times we see Bond shave include the movies Live And Let Die (Schick injector razor with Schick lather shaving cream), Die Another Day (Norelco/Philips shaver) and SkyFall (razor, brush, wooden bowl). The Gillette Slim Adjustable is a great razor second only to the legendary Fat Boy as the most popular double edge razors Gillette ever produced. With a Feather blade this razor produces a great shave. Many of these are in everyday use over forty years after they were made. They are BUILT. The blades are widely available. The most common brand in the US is the Personna, available at 10 for about $2 at Wal-Mart. But you can buy the exact same blades for $6 or $8 in store-brand packaging in pharmacies all over the country, if Wal-Mart is too low class for a Bond fan. There are probably dozens of other brands available from mail order. A website called badgerandblade.com has more detail on all of this than you could read in a month. The razor is adjustable, 1 being very mild and 9 relatively aggressive. The only trick to the Slim (or the earlier Fat Boy) is that you should turn the twist-to-open knob (which is the bottom end of the handle) enough that the blade cover doors are just slightly loose before turning the adjustment ring. Then tighten the twist-to-open firmly, and have at it-- slowly and carefully, without pressing the razor against the face. I've heard it said that turning the adjustment ring without having the doors that little bit loose will damage the mechanism. Whether or not it does, it WILL prevent the adjustment from taking place. They have other great vintage shavings stuff as well! I shave like Bond every day. I just got a '64 Slim and I said bye-bye to expensive cartridges forever! Throw your Mach 3's away! I just recieved my father's old Gillette Khaki safety razor from WW2. It comes with the blade cannister and a small reflective mirror. Bought some new blades, and it is giving the best shave ever. It's made shaving more enjoyable, as it requires some skill to use, instead of just dragging it over the face at record speed. I think this one would be considered a heavweight, it has a slightly thick handle which screws into the head. Not bad for a 71 year old razor! Gentlemen, I use this razor daily and have even replaced my Floris razor, brush and stand with this great bit of kit, however I still finish off with some No89. Thats me set for the day and ready to tackle whatever is out there. There is a little bit of Bond in all of us, release him ! The Gillette Slim adjustable is a nice razor to own and use, although The Executive Shaving Company's prices are ridiculously high at the time I'm posting this - unless they've been re-plated and the numbers re-painted but the listings don't say they have been. They can be had for much less from eBay and from classifieds sections on the various internet shaving forums. The Executive Shaving Company prices are what you'd expect to pay for a Gillette Fat Boy adjustable, but not a Gillette Slim adjustable. I started to shave with the fat boy and left it on 1 for 40 years. I used SCHICK Chromium Chrome Blades in the Fat Boy and used Noxzema Red can. One day without warning, Gillette just pulled all their adjustable razors from the market !!! I was very angry and called them to try to get a razor and they said, no razors in stock anywhere !!! Then the throw away light weight cheap plastic razors came out for the yuppies. They sliced me open for years until they were improved. I still have 10 packs of Schick Blades though and want to get the fat boy for one more try. I have a Gillette Slim, a Fat Boy and a Super Speed and I agree that they are all built very well. These converted me to DE shaving. Everyone needs to find their own way - after a while I found the Gillette razors too mild and I now use a Mühle R41, probably the most aggressive razor out there. I also found that an Alum Bloc from India is a real gem of a find. These things are fantastic and I completely recommend that everyone tries one as part of their routine. Why would Commander Bond downgrade to a nonadjustable non butterfly WW1 design Merk. Now that makes no sense.